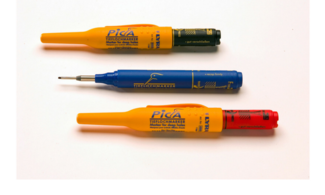 The brilliantly simple Pica Markers have a stainless steel telescopic nib and permanent ink. Perfect for writing on deep holes and hard to reach places in control panels and on contactors, din rail terminals, tool boxes etc. Available below in red, blue and black.